While it might be Halloween tonight, I wanted to write about something more important and more worthy of a write up. 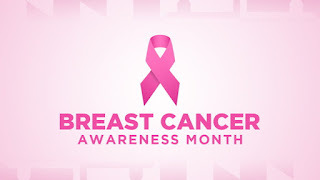 This month, October, has been Breast Cancer Awareness Month. It's a worldwide annual campaign involving thousands of organisations, to highlight the importance of breast awareness, education and research. Breast Cancer Now aim to get as many people as possible involved in raising awareness and funds for breast cancer research. As the UK's largest breast cancer research charity, along with supporters, they campaign to raise money via an array of events across the UK as well as, of course, wearing it pink! Revision Week and my First Eyebrow Tweezing Experience! With the year one exam, right around the corner, I have my last week of labour suite placement, win a competition, go to a couple of archery socials and win a competition. Oh and of course, revise! I finally got around to getting this post together and just in time for Halloween! I went to Wilko on the way home from placement one night and picked up a bunch of little decorations for £1 each. I loved the two garland options so I picked up both some bats and pumpkins. This are absolutely amazing and look fab. They are super easy to open up and use, they just simply unfold. I got some spider webs. Honestly, I love how it looks but it's a complete nightmare to make look good. You have to work the webbing really hard to get it to look even half way decent. Plus, there aren't many spiders. I would defintely go for white if you want this as the black doesn't have the same effect. I picked up a table cloth because I thought it would be nice to have in the kitchen to make it a little festive. I love that it was the perfect size and it wipes clean so can be used every day until Halloween. As you’ve seen, my summer has been a little busy the last 4 weeks. I don’t know if it’s because it’s such a shorter holiday than I’m normally used to or if it’s the fact I’ve just tried to fit too much in but nevertheless, it’s felt very busy. I’ve literally had 2 days at home in the entire period. The summer started with my mum’s wedding. It was everything she wanted so despite partying 6am until 1am, it was worth it. The next week, I headed to Wales to see my dad. I’ve only seen him briefly for just a couple of days this year so I felt I beed e to make the effort to see him this summer. Originally, I was going to go on holiday with my friend, Sarah, but unfortunately with her limited time off and my dad’s travel plans it just didn’t work out. Luckily, she found someone or to go with otherwise I would have felt really bad. Finally, I spent the last of my time in Bulgaria. It was the perfect rest I n reed and I loved the sun, sea and sand. Apparently, Goose Fair is a big event in Nottingham so myself, Sam and Vicki headed over for some yummy food and rides, before I went home for a quick trip to surprise my mum! In Midwifery, as students, we do something called case holding. Each year we follow 2 women from booking through to labour and delivery and then hopefully postnatally as well. One of my ladies delivered and I was so happy that I got the chance to go and see her on the ward and meet the new little baby. "Goose Fair is one of Europe's largest travelling fairs with a history that dates back more than 700 years. Amongst the array of Roller Coasters, Water Rides, Giant Wheels, Bombers, Dodgems, Twists, Waltzers and Miamis familiar to Goose Fair there will be a number of new attractions that have not visited Nottingham before."